Drop shipping retailers sell large assortments of items they do not independently own, stock or fulfil by having a supplier send the item directly to the end customer. When done right, drop shipped items are fulfilled with the same branding, shipping performance and customer experience as if they had come from the retailer's own warehouse, while allowing the retailer to take no inventory risk and enjoy wholesale margins. The rise of the internet led to industry-wide adoption in many countries over the past two decades, and its progress shows no sign of slowing. Drop shipping is becoming a core competency for the retailer and supplier alike. Before the internet, wholesale fulfilment was concerned with bulk replenishment. Items were shipped in large volumes from a manufacturer or supplier's distribution centre (DC) to a retailer's store or cross-dock facility - think forklifts and pallets. Direct-to-consumer (D2C) fulfilment was largely non-wholesale. Cataloguers were fulfilling from their own inventory in specialised warehouses that could pick and pack single items - think small boxes and UPS at your door. At the time, there were also catalogue-only retailers and premium incentives vendors. These companies built their businesses by being the sales channel for the products held by other D2C cataloguers. They took top line revenue and marked up the cost of the goods, plus delivery and handling. It was primitive. Four to six weeks for delivery was standard, and communications were on paper or via fax. But this was true drop shipping. Though SKU assortments were typically small, volumes could be very large. Meanwhile, a class of distributors existed who specialised in replenishment for small businesses, would buy products in bulk from manufacturers and pick relatively small shipments for many stores. When early drop shipping retailers came calling, it was these distributors who found themselves well prepared to start shipping in high volumes directly to customers in a completely transparent way. It was soon clear that ecommerce was the future. Established retailers began to dabble with ecommerce, setting up experimental teams separate from the main organisation to build a primitive site and ship out the products from the corner of a DC. Pure-play retailers were born - a new brand of retailer who were purely digital, owning no stores, warehouses, or stock. Their focus was branding, merchandising, and customer support. They would rely on drop ship distributors to fulfil products at wholesale. Drop shipping was not only attracting suppliers, but also the attention of traditional retailers. There was no lack of shelf space online, and drop shipping stopped restricting assortment. The endless aisle was born. 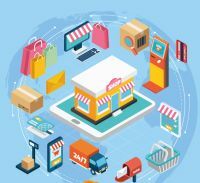 Meanwhile, customer expectations for the online experience were low as consumers were still learning how to shop online. They were happy when they received an email saying their product was on its way and would be delivered in 10 days. At the same time, retailers were learning how to sell online, fulfilling out of their own DCs or drop shippers. Retailers were scrambling to invent their ecommerce story and sales rocketed. From getting products up on their website, to taking returns, ecommerce was beginning to boom. Those retailers who aggressively pursued drop shipping saw sales grow even faster. Increased assortment directly correlated with a higher sales growth, and drop ship provided just that. Savvy retailers would seek out new products and might be connected to thousands of drop ship suppliers to fulfil them. However, operating drop ship networks at scale was a challenge, particularly with paper and fax communication. Real-time visibility into order status was needed and knowing that a drop shipped item was out of stock meant the difference between a happy customer and a lost customer. High volumes required electronic integration, and some drop ship suppliers simply didn't have the IT competency. Drop shippers saw huge growth as they found more retailers to whom they could sell. The challenges included satisfying retailers' integration and program requirements, managing product content like images and descriptions, keeping products in stock, and meeting fulfilment performance expectations. As time passed, retailers would learn to raise expectations. Amazon became the driving force in retail. They aggressively embraced drop shipping and continued to outpace aggregate ecommerce growth as they tightened their operations and improved their control. Thanks to Amazon, customers' expectations were raised. The average consumer expects to see a large assortment of items and find the item they are looking for, all whilst demanding fast and free shipping. Amazon raised the bar by building warehouses everywhere. It was their goal to have millions of SKUs within one-day ground shipping to 99% of the population. The company is an expert at load balancing, consolidating shipments, and maximising inventory turns. Today, retailers focused on faster turnaround among their drop ship suppliers and optimised shipping rates. The pressure to offer expanded assortments is still relentless, but retailers must pay attention to the productivity of each SKU. Insight into SKU velocity by brand, category and margin has never been more important. Brands are also moving into the drop shipping game. They now recognise that controlling the direct-to-consumer distribution of their goods themselves is critical to combatting grey market sales and keeping control of their brand. Distributors and brands are answering consumer demand for fast, efficient delivery by dispersing their inventories across the country. By building warehouses near every major metropolitan area, Amazon has upped the ante. Third party logistics warehouses are coming to the rescue of brands and drop shippers by helping them load balance their inventory geographically and deliver their products quickly and cheaply. Drop shipping is an essential competency for virtually all retailers and brands, who will only see increasing pressure to provide larger assortments and faster, cheaper shipping. Meanwhile, retailers need to balance those pressures against the need to control their own identity and maintain their own customer relationships outside of the Amazon ecosystem. In any event, retailers cannot build enough warehouses or invest in enough inventory to sustain the kinds of growth necessary to ensure their survival. Drop shipping is here to stay.